Not only very useful if you are messing about with guitar amp tonestacks (and not much use if you're not), TSC is fun and a learn-by-doing tool! As a simulator I've yet to fault it, and it's very much quicker than birdsnesting a circuit on the bench. Its output graphs have already been used on this site. This programme only models a pre-set range of tonestack circuits (Fender, Vox, Marshall, James, E-Series, Bench, BigMuff; you can't enter your own circuit as in EWB or Spice), but within that limitation you can change everything significant about the components; and it does this limited job very well indeed. You can rewire to a very limited extent by setting components to open or short values. A lovely little tool/plaything. This is actually a DOS programme so it will even run on your food blender, but the user interface is typically DOS-clunky as a result. It's a bit of a secret what ECAP actually stands for, perhaps Electronic Circuit Analysis Programme? 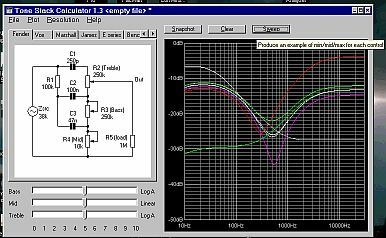 PC-ECAP is an easy to use AC circuit analysis program which analyzes circuits consisting of resistors, capacitors, inductors, transformers, transmission lines, transistors (both bipolar and FET's), operational amplifiers and transconductance amplifiers. Nagware - every startup reminds you how many times you have used it, and to register. The Main Menu - functions helpfully fall-through in logical order. ECAP allows the entry of an arbitary circuit, including active devices, so full amplifiers can be modeled. To use this tool you need to understand how to first convert the circuit you are investigating into an AC network nodelist. The signal is injected into node 1 and sampled at node 4, over 100Hz to 10kHz, with a log sweep. The plot produces two output graphs (and value lists if required), magnitude/amplitude, and phase. ECAP's internal nodelist editor is a primative EdLin-type; good only for minor changes and corrections on the fly. For initial nodelist entry and major changes an external text editor is less frustrating. Analyze your circuits before you build them! PC-ECAP has been one of the world's best linear circuit analysis programs. The software will calculate and plot: gain, phase, group delay, impedance, VSWR and return loss. This versatile program can also calculate your circuit's transient response, using one of eight waveforms: pulse, 3 types of step functions, ramp, square wave, triangle wave and sine wave. Don't think a powerful circuit analysis program has to be hard to use. 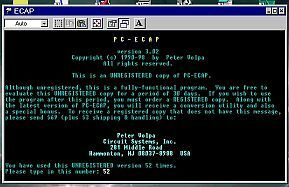 PC-ECAP is completely menu driven to make operation truly a breeze. Want a file? A sorted list is displayed full screen, just highlight your choice and go. 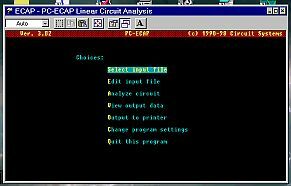 Use its built-in full screen text editor with pop-up help to describe the circuit to be simulated. Or use its bipolar transistor model maker to create a Hybrid-Pi transistor model. With a frequency range of .001Hz to 999GHz, you will find uses for PC-ECAP from below audio to microwave. The program handles circuits with up to 90 nodes and 1000 components. High resolution graphs may be displayed on screen or plotted on 9/24 pin dot matrix or HP LaserJet or HP DeskJet printers. The registered version even includes a utility to create Lotus 1-2-3 compatible spreadsheets from your analysis data. All video adapters are supported. Only $69. Works with DOS, Windows 3.1 and Windows 95. 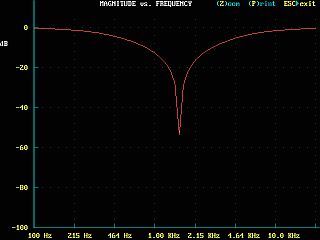 Magnitude, Phase, Group Delay, Impedance, VSWR and Return Loss. 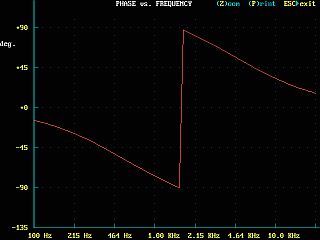 Transient response for step, pulse, ramp, square, triangle and sine inputs. Completely menu driven - very easy to use. Handles up to 90 nodes, and 1000 components. Built in full screen editor with on-line help function. Common abbreviations such as P, U, N, M, K, MEG, G are recognized. High resolution plots on 9 and 24 pin printers, HP LaserJet, and HP DeskJet. Output to LPT1, LPT2, LPT3 or a disk file. Bipolar transistor model maker creates Hybrid-Pi models for your transistors. Will utilize a math coprocessor if available, but does not require one. At last - a fully functional freeware Spice simulator. Spice has been around for quite a long time in various formats, but the only free version has been a student version with some pretty serious limitations. Now Linear Technology Corp. has seen it in their interests to release a fully functional freeware version. Naturally the component libraries it comes with contain all, but only, the devices they manufacture, but it has quickly been taken up and a very active community of users have compiled libraries of more generally available components, and circuit modules that cover a very wide range including models of valves, LDR's, neons, LED's, IC's, and so on. It also has a high degree of compatability with files composed for other mainstream versions of Spice, meaning that most device models available from other component manufacturers will run with little or no modification. The files that define models, circuits, and component symbols are all plain ASCII text, making down-and-dirty editing and creation possible if required. There is an active Yahoo LT-Spice group that has accumulated a very large library of such models and has a forum where considerable modeling experience is available. Unlike ECAP (above) LT-Spice allows “schematic capture”, that is you generate the required node list by simply drawing your circuit. One interesting feature is that you can test your tonestack or fuzzbox with a .WAV file and see how it reacts to real-world inputs. Given the capability, widespread adoption, and price, this leaves ECAP (above) for dead. I'm currently running it on light hardware under XP. I have had encounters with a couple of different versions of this, an early one and a later student version provided by a technical training college to distance education students as an alternative to attending prac sessions. This is a big ask, that simulation software is so robust, effective, and easy to use that unsupervised trainees will get valid results. My experience suggests that the educational establishment might be expecting a bit too much of this technology to deliver educational outcomes. I was sat down to an early version of EWB and invited to “do something”. So I entered a very minimal three-transistor fully-comp output stage that had been built literally by the tens-of-thousands without any real problems - the circuit entry and test gear all reasonably obvious. But oh my, when it was asked to do the DC conditions it fell in an endlessly recursive heap trying to resolve the stavation class-B bias situation. Oh well, I'll try a phase-locked loop idea instead. Well, well, well. It would allow me to draw a mixed-mode analogue and digital circuit, but it wouldn't simulate it. Several years later I'm asked to help a distance-education student get sensible results from the version of EWB supplied by the college as part of an electronics course. This time the results were similar, but they were compounded by differences between the supplied coursework and how their systems actually operated both off- and on-line. The impression was of too much “she'll be right” blue-sky optimism, and not nearly enough reality testing. Every now and then you come across some system or software where it is blindingly obvious that the authors never sat down and worked through their creation before unleashing it on the unsuspecting. I'm sure we have all encountered Web pages that were built “broken” and dysfunctional, but my current favorite is a printed instruction from an ISP telling the new user to log in and enter their name and password, yet the system won't allow a login until the user has a registered name and password! These experiences confirmed my opinion that when using EWB you had better know what to expect before you start, which rather defeats the point of simulation in EWB. The tool itself is a large part of the problem. But there is a trap with ALL forms of simulation, and that is that you are dealing with a map, not the actual territory; that you must keep your head firmly screwed on and reality-check the output of any simulation to catch errors in the simulation phase. I can't help feeling that time spent fiddling with your circuit in EWB would be better employed birdsnesting the real thing on the bench. Not free, and not worth paying for.